It's always been the weather. Probably since time began, Santa Barbara County's attraction and staying power has been weather-driven. And most especially to the wineries who call the area home. The padres at the Santa Barbara Mission figured out 200 years ago that the local geography, topography and climate were just about perfect for grape growing, and they maintained several vineyards. Unlike any other coastal mountain range on the left coast of North America, the Santa Ynez Mountains run east-west. This transverse range creates valleys opening to the Pacific Ocean, allowing the inland flow of fog and ocean breezes to keep the climate temperate, thereby making this one of the most versatile grape growing regions in the state. Vineyards cover close to 10,000 acres in Santa Maria, Santa Ynez, and Los Alamos; and because of microclimates, all the classic grape varieties are able to be grown, including, Chardonnay, Pinot Noir, Riesling, Sauvignon Blanc, Syrah, Merlot, Cabernet Sauvignon and Gewruztraminer. Although many of the wineries are small, family-owned operations, with annual production ranging from 500 to 75,000 cases, most have tasting rooms and picnic areas and some offer tours. While a thorough tour of Santa Barbara County's wine country deserves several days to not only take in the wineries, but the scenery as well, there are six 'loops'- clusters of tasting rooms- that lend themselves to shorter blocks of time. They are Buellton-Lompoc, Santa Ynez-Ballard, Los Olivos, Foxen and Alisos Canyon roads, Santa Maria, and the City of Santa Barbara. 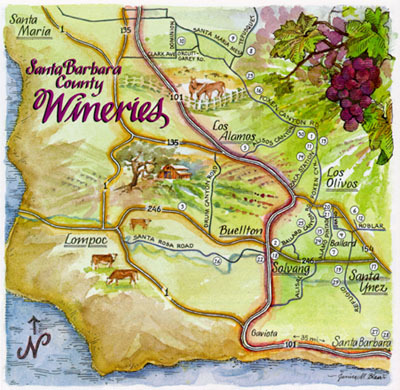 The Santa Barbara County Vintners' Association produces festivals, seminars and tastings throughout the year and can provide more information and winery touring maps. Write to them at PO Box 1558, Santa Ynez, CA. 93460-1558 or call 805-688-0881 or toll free 1-800-218-0881.